There are three stages to the life cycle of corrugated cardboard: it arrives as a shipping container, becomes an enchanted fairy princess castle, is put to use restoring the soil. Each has its purpose, but the last pays dividends for a long, long time. 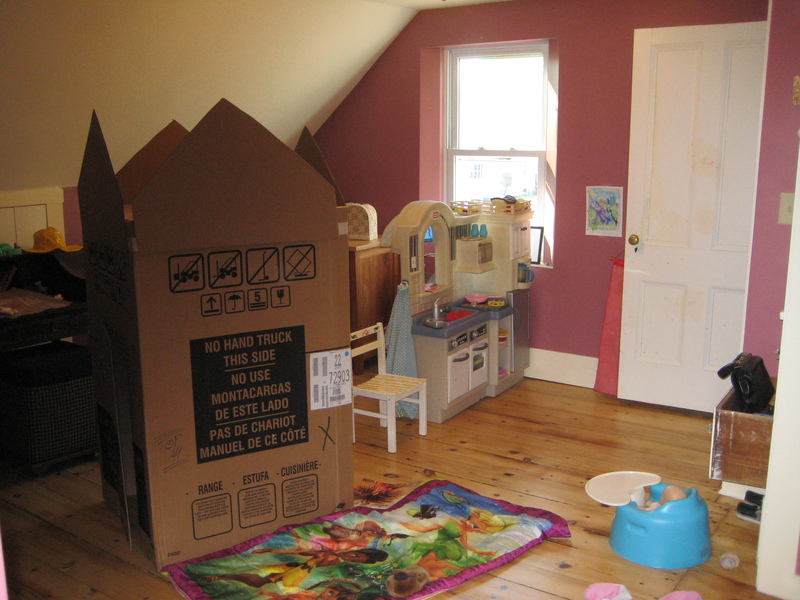 During our renovation, new appliances arrived packed in lots of cardboard. I was as excited for the packaging as for the appliances. The cardboard was repurposed quickly, as a fairy princess castle was ordered. I was up to that challenge. 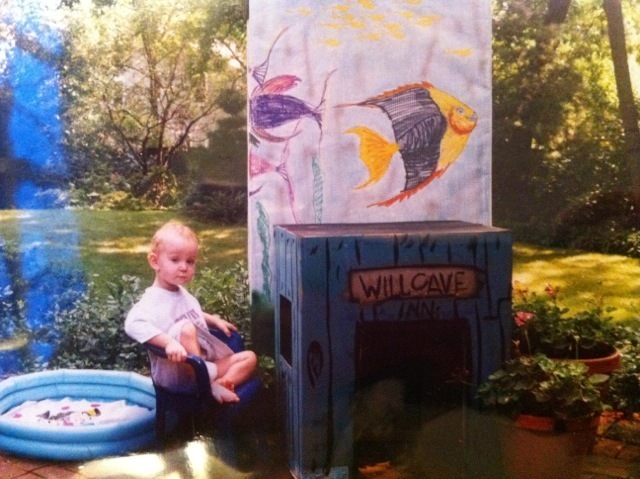 Many years back, I transformed, for my Nephew, some boxes into an underwater cave surrounded with schools of fish. These days my ambitions are less grand and a few cuts with a sharp knife sufficed here. The rest was left to our daughter’s imagination. Of which she has plenty. The corrugated cardboard became a key layer of the 12-inch sheet mulch for the 600 sf vegetable garden that we are preparing for next season. We layered the materials in October to allow them to decompose over the winter. I first learned about sheet mulch from David Homa, of Post Carbon Maine. He is a local maven of permaculture and gave me this list of ingredients: lawn, stone dust, crushed shells, seaweed, leaves, finished compost, newspaper, straw. newspaper, corrugated box cardboard without staples or tape. cloth, old clothing, or wool carpet, provided they contain no synthetic fabric, but these take far longer to decay than paper. Soil amendments: lime, rock phosphate, bonemeal, rock dust, kelp meal, blood meal, and so on. Compost, about 1⁄4 to 1⁄2 cubic yard (6 to 12 cubic feet). My own recipe was based on the materials on hand. 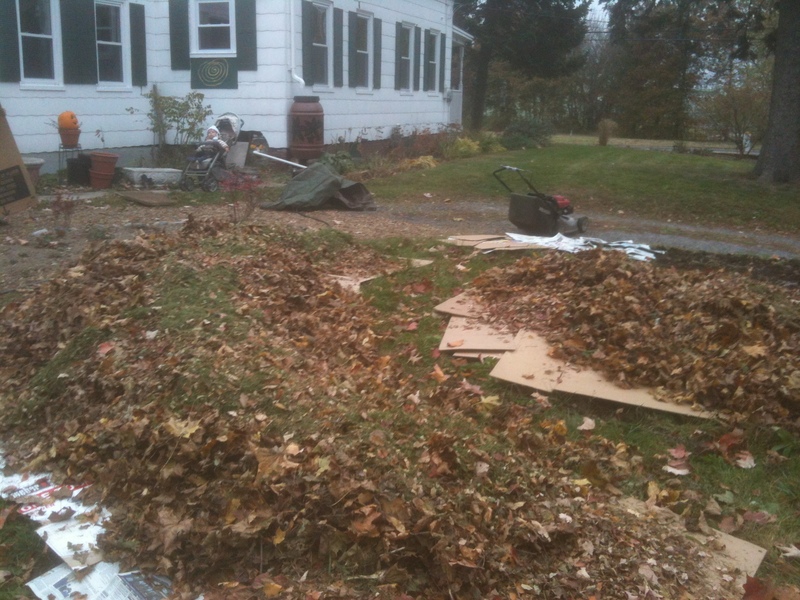 My first layer was about three inches of horse manure applied directly on top of the lawn. 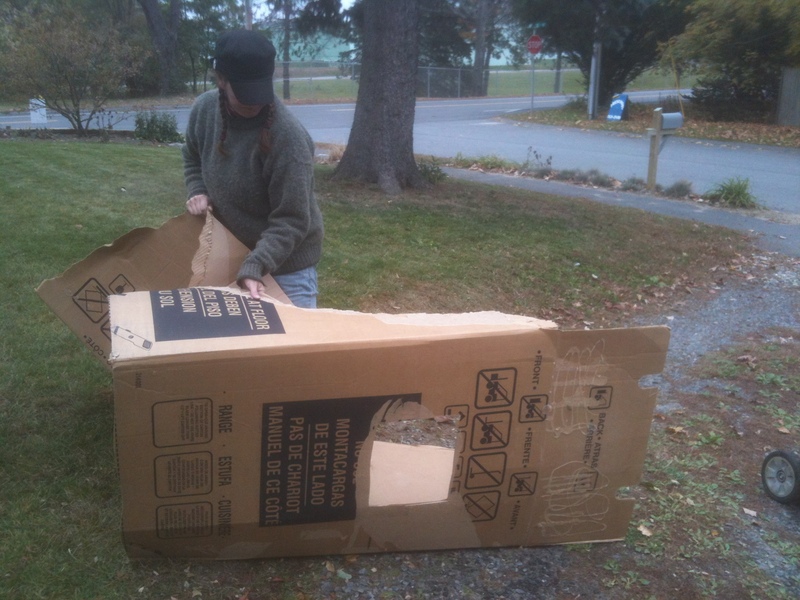 I scattered stone dust and then layered the corrugated box cardboard. The cardboard was placed above the manure to create a barrier preventing hayseeds from sprouting. Newspaper was used to fill in the gaps between the pieces of cardboard. 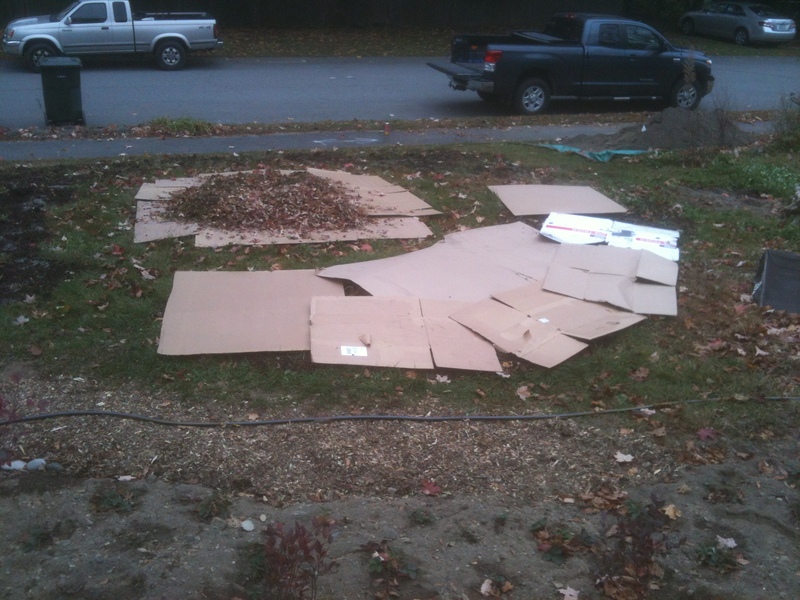 Wood chips were spread thickly on top of the cardboard, and then, for bulk organic matter, we put maple leaves, grass clippings, end-of-season cuttings of comfrey, hosta and other perennials. 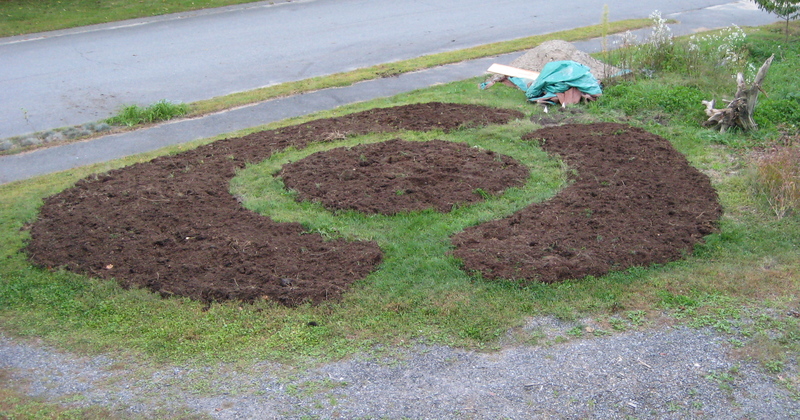 The brown – carbon – side seemed to be dominant, so to boost the nitrogen side, I mowed my neighbors lawn (with fallen maple leaves) and added that into the mix. My neighbor was thrilled – and a bit incredulous – at my generosity, but I still think I got the better side of that trade. I would have liked to add seaweed into the mix, but I never found the time to get down to the shore. 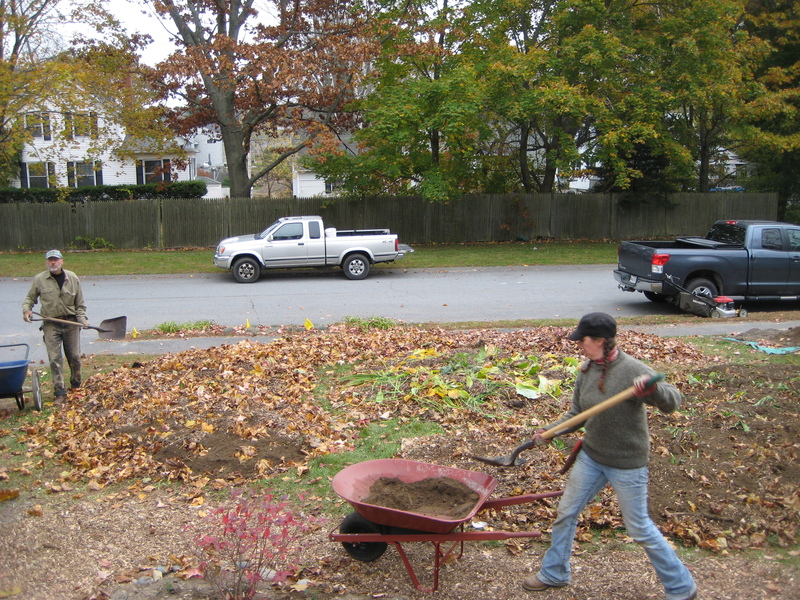 Our final layer was loam, primarily as a weight to keep the leaves and clippings from blowing during late autumn storms. I would have liked to top dress everything with a layer of finished compost, but that can wait until spring. Gone are the days of “double dig” garden beds, and whether the rationale is carbon sequestration or protecting the soil structure, my back definitely was better off for following the sheet mulch approach. We are building the beds directly on top of the existing lawn. I have no idea what our final C:N ratio was but I remain steadfast in my belief that nature is forgiving. 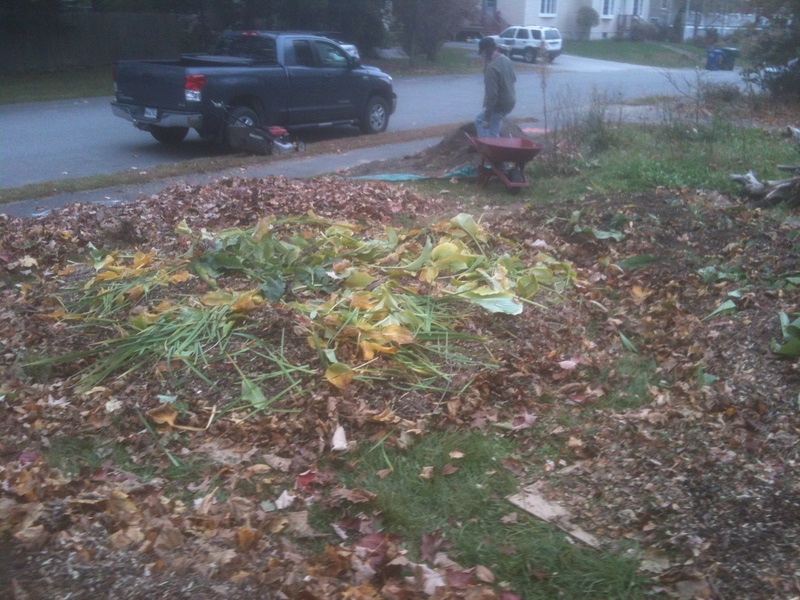 We were close enough, and will continue to add layers of rich organic mulch annually. We have made a big step forward toward our sun-loving vegetable garden. looking good! We use newspapers here, lots & lots!